Today’s special buildings need special glass. Sharda Architectural Glass are the industry specialists who manufacture this glass and work in partnership to deliver specialist glass solutions globally. Design Inc are proud of our relationship with Sharda and are pleased to have conceived, planned and built a regenerated online presence for them. Being an integrated agency, we started working with Sharda last year when we created a series of printed direct mail campaigns, including their innovative & award-winning, Inspired-Desired! mailers. Following on from the success of these campaigns, Design Inc were asked to look at a major overhaul of the brand to take the company forward for its next stage of evolution. How Sharda’s architectural glass products and attention to detail enables the design and construction of amazing landmark projects worldwide. How Sharda form larger partnerships with leading firms of architects, engineers, designers and construction businesses. Working as a project team component requires an integrated approach and flexible attitude as well as a deep understanding of the building design supply chain. Identity and name: Evolving the outdated Sharda Glass identity and creation of a new descriptor “Architectural Glass’ to reflect the new positioning as partners to the major international players in the built environment sector. Web Design: Web site interfaces, site architecture, imagery, typography information hierarchy and programming. Including lead capture devices. 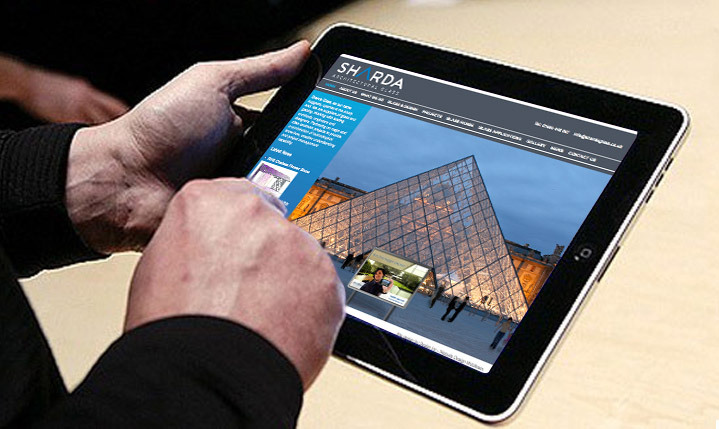 The homepage movie shows a series of striking glass building applications, representing the endless range of projects served by Sharda Glass. Each time zoomed out to reveal that the image is part of a bigger picture. Content: The site map has been designed to cater for both the high level user looking for a strategic partner for a project or framework agreement or alternatively the project architect looking for a specific innovation in glass technology, technical information or application examples. If you are considering a forthcoming creative/marketing project, you may be interested in receiving Design Inc’s Information Pack. Call now to receive one.